After being shunned by gamers for franchise fatigue in the mid-2000s, Lara Croft is a prominent player in the industry again. While history has shown that fans of the famed spelunker favor quality over quantity, Square Enix is taking full advantage of Lara’s resurgence, and isn’t balking at the chance of throwing her into as many adventures as possible. Lara returns this fall in the highly anticipated Rise of the Tomb Raider. She recently tangoed with a giant crocodile in the isometric adventure Lara Croft and the Temple of Osiris. She also can’t stop running in the recently released Lara Croft: Relic Run for mobile devices. Today welcomes another chapter in her rebooted life, Lara Croft Go, a turn-based puzzle game that, while sounding like a strange fit for the heroine, is immensely enjoyable and surprisingly true to the source material. Yes, Lara Croft is everywhere these days, but Square Enix has done a nice job of making all four of her current series distinct. 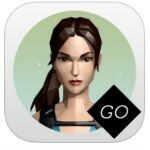 Lara Croft Go is similar in design to Square Enix Montreal’s Hitman Go title, in which a flick of the finger moves Lara one square at a time, which may be forward along a path, or up a dangerous cavern wall. After she moves one space, the board gets a turn of its own. This means that spinning saw blades move one space, platforms raise or lower one space, and dangerous creatures like human-sized lizards give chase. A turn can also be spent interacting with a switch or moving a pillar. The turn-based mechanics are simple in scope, but work remarkably well. Most of my intended swipes were immediately recognized, and I never ran into the problem of the game misinterpreting my intent. Although Lara is ultimately questing to unearth a lost artifact in this adventure, her goal in each stage is much simpler in scope: Reach the exit. This is easier said than done, since the puzzle solutions Square Enix Montreal worked up are quite tricky. While many of the early stages can be solved with little effort, the final two acts of the game – The Maze of Spirits and The Escape – are incredibly challenging, often leaving me stumped for a dozen-plus tries before I figured out the solution. Some puzzles have Lara throwing spears at distant targets or pushing certain enemies back through the fear of fire emitting from a torch she carries. These puzzle dynamics add layers to the already complex environment navigation. Several solutions require dozens of movements and a fair amount of backpedaling to line up enemies in specific locations so Lara can squeak by. This level of difficulty can be frustrating – Square Enix Montreal knows this, and even baked in a “solve all puzzles” in-game purchase for those of you who are unable to find safe passage through an environment. Despite feeling helpless and uncertain about a few puzzle solutions, I enjoyed my time with Lara Craft Go. The game is gorgeous and cleverly spins Lara’s tomb-raiding exploits into a new experience. Square Enix even tips the hat to the little details, like Lara sometimes climbing a ledge with an acrobatic handstand. If you’re looking for something a little different in the mobile space, I can’t recommend this game enough. Just be warned: The puzzle difficulty is designed to mess with your mind and push you to think outside of the box…or boot up YouTube to watch someone else solve it. A gorgeous game that cleverly spins Lara’s tomb-raiding exploits into a new experience.